Read ROBIN DOWNES DESIGN Archives of Older Product Reviews by TDmonthly. Watch ROBIN DOWNES DESIGN Archives of Older Product Videos by TDmonthly. For all those who ever wished they could motivate the kids to help with housework, we are happy to introduce the ideal answer, the all-new Fair Share Chore Cards. In place of hearts, spades, aces and clubs, this colorful 52-card deck features symbols that represent a wide array of household tasks. Appropriately, the only ace in the deck is one ‘get out of a chore free’ card. 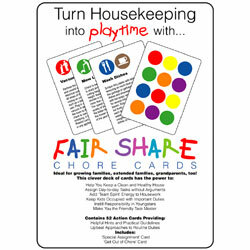 Fair Share Chore Cards turn everyday housework into a game the whole family will want to play. Because chore assignments are left to the luck of the draw, it eliminates those dreaded arguments among siblings and takes the phrase ‘that’s not fair’ out of the housework equation. In addition to the ongoing thrill of chance, the intrinsic value of Fair Share Chore Cards lies in the helpful directions printed on each card. Whichever chores players are assigned, the accompanying cards promote safety, efficiency and a job well done every time. 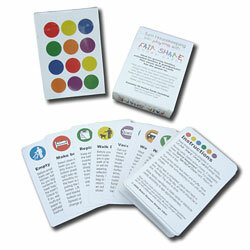 Open the deck and you will discover a broad range of common tasks printed one to a card. On each card, ‘how to’ guidelines cover everything from watering plants to setting the table, making a salad, ironing clothes, dusting, washing dishes, cleaning mirrors and windows, sewing on buttons, emptying trash, replacing the toilet paper and more. 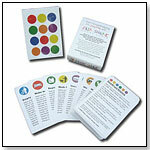 According to the game’s enclosed instructions, an adult simply reviews the cards and selects the tasks that need to be accomplished. Those call-to-action cards are placed face down and shuffled. Family members take turns picking cards, one at a time, until all have been chosen. Then, the work begins. As each task is completed, the coordinating card is returned to the deck until all the housework is done. Just in case a necessary chore does not appear in the deck, the ‘special assignment card’ — with its stylized covert ops image — comes into play. For added fun, the ‘get out of a chore free’ card gives a lucky player a break from one assignment. Robin Downes Design brings over 30 years experience, innovative ideas, up-to-date technology, and professional dedication to graphic design, art direction, layout, production, copywriting, and print supervision. Our design knowledge combines with technological expertise to meet the needs of companies large and small. At Robin Downes Design, we use the latest advances in technology to give our clients the professional design edge needed in today’s competitive market. No matter what you need... we customize a total design package for your company, and do it for less than you'd expect. Your printed pieces are integral to your company’s image. Let us show you what we can do for you. Because it’s not the technology ... it’s how we use it.